Our regular Weekend Gig Pick post isn’t quite so regular these days, but when there’s something we feel you really must see we’ll make sure we tell you about it. 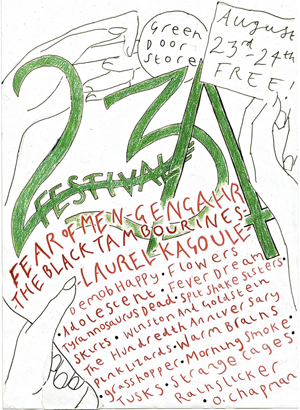 This weekend the Green Door Store are holding their second annual 234 mini-festival, with a mixture of talent from in and out of town playing over the course of the weekend. This year it’s moved from the first weekend in August to the Bank Holiday weekend to avoid clashing with Pride, but it’s still free to see the fantastic line up they’re putting on. The music starts at 2pm on Saturday with an opening set from Grasshopper, and is followed by a host of Brighton bands who’ve graced our posts (and a number who haven’t yet). 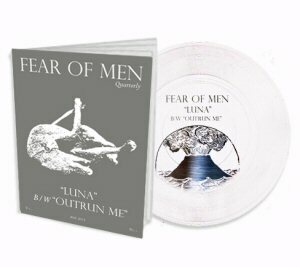 Keep an eye out on Saturday for The Hundredth Anniversary, Adolescent, Tyrannosaurus Dead, Demob Happy and Fear of Men. Sunday hosts more of the out of town acts, but kicks off with the local post-folk act Rainslicker. Highlights for us on Sunday are Skirts, Winston & Goldstein and Spit Shake Sisters. Last night Momotaro and Winston & Goldstein supported Garden City Movement at a sweltering night at The Hope. May always passes too fast for us in Brighton — too many things to do and not enough time to do them all. We did get enough time to get our ears around plenty of local new music though, and here’s our pick of the bunch. Finally we have Non Omnis Moriar. We joked when we wrote about this at the very end of April that we don’t often post up Latin on the blog, but we’ve also gone and featured Us Baby Bear Bones Ursari in this month’s top ten (Ursari being Bear in Latin). You can catch Winston & Goldstein live for free at the Green Door Store on 9th June, on the bill with Brighton Music Blog favourites Dog in the Snow.